Rocky Marciano's legendary 49-0 record: For it to be truly broken, must it be a reigning heavyweight champion who reaches 50-0? 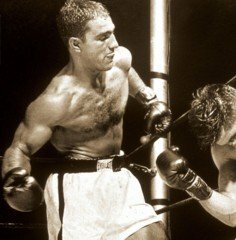 Rocky Marciano’s legendary 49-0 record: For it to be truly broken, must it be a reigning heavyweight champion who reaches 50-0? Back in 2015, when Floyd Mayweather tied beloved heavyweight champ Rocky Marciano’s 49-0 record, the late ex-champ’s brother, Peter Marciano, was less than moved. It would have been better, more newsworthy, more impressive, he said, if another heavyweight champion had equalled his brother’s astonishing numbers, not a welterweight. But if any fighter who isn’t a reigning and defending heavyweight champion manages to go to 50-0 and then retire, unbeaten, never to return, would that fighter really have broken Rocky’s record? No, it has to be a heavyweight king that goes 50-0 before Marciano’s amazing ledger is truly topped. The closes any recent heavyweight has come is the colossus that was WBA heavyweight champ Nikolai Valuev, who in 2007 got the 47-0. Right now, for a reigning, unbeaten heavyweight champ to break Marciano’s record we have to consider this: Deontay Wilder, the closest at 38-0, would need a further 12 title retentions to do it (possible, especially if Wilder gets away with defending against further perceived “easy” or “safe” challengers). Anthony Joshua, 18-0, would need 32 more title wins to do it! (so absolutely no chance there). While if the 25-0 Tyson Fury comes back, he will need to double his current number of wins to break “The Rock’s” record (again, zero chance), and you get the idea. It really is clear to see what an astonishing set of numbers Marciano put together in a boxing ring. And as Rocky was a heavyweight champion when he set his record, only a heavyweight ruler can break it. As such, The Brockton legend’s record looks to be safe for a good many years from now. You are here: Home / Boxing History / Rocky Marciano’s legendary 49-0 record: For it to be truly broken, must it be a reigning heavyweight champion who reaches 50-0?